Buryat customs, hybrid architecture and eternal relics: RBTH has assembled an informative guide to Buddhism beyond the Urals. Buddhism is not the most widespread religion in Russia. According to the Levada Center, only 1% of the population call themselves Buddhist. Most live in Siberia, especially in the Republic of Tuva, in the Zabaykalsky Territory, in the Republic of Buryatia and in the Irkutsk Region (these regions range from 3700-6300 kilometers from Moscow), although Buddhist communities and temples can also be found in Moscow and St. Petersburg. However, if you want to learn about the traditions, history and spirit of Buddhism in Russia in great detail and how it differs from Tibetan Buddhism, then you’ll have to go to Siberia. 1. Buddhism spread in Siberia in the 17th century. It penetrated these cold lands from Mongolia, after originating in Tibet. Аn interesting fact is that in the Tibetan tradition a “datsan” is merely a department in a university. However, since Siberian Buddhism was isolated from other countries’ traditions for a long time, locally the word datsan has ended up referring not just to a university, but to an entire monastic complex. 2. In the 1740s the first datsans in Buryatia and Tuva were mobile and made not of stone, but of felt, so they looked like portable yurts early in their history. This is not surprising, as yurts were the Buryat peoples’ traditional dwelling. Later felt datsans were replaced by wooden ones, and still later on by others made of stone. 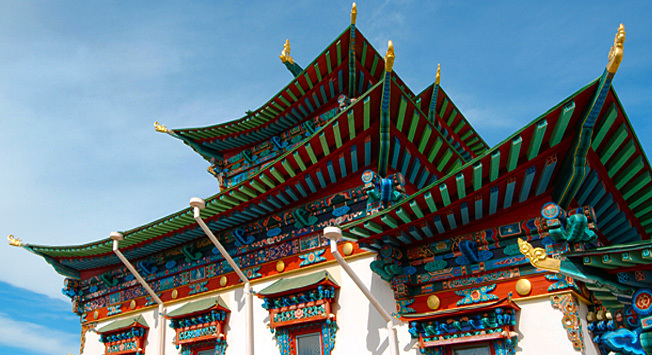 A mixture of architectural elements from Buryat culture, the Buddhist canon and Russian and Chinese architectural traditions emerged over the centuries. For example, the upward curved ends of gabled roofs in Siberian datsans are a tradition that originated in Mongolia and China. Therefore Siberia’s Buddhist temples’ eclecticism differentiates them from Central Asian monasteries. 3. Ever since ancient times, shamanistic traditions have been quite strong in the regions of Transbaikal (near Lake Baikal), Tuva and Buryatia. As a result the growth of Buddhism in Siberia was initially a contentious process: lamas (Buddhist monks) used to hunt down shamans and burn their ritual objects, especially talismans made of wolf teeth, reindeer horns or bird feathers. 4. Lamas in Siberia didn’t always have an easy life, either. In the 20 th century many Buddhist monasteries were destroyed and lamas, like Orthodox priests, were persecuted. In the 1930s many lamas were shot for “counter-revolutionary activity” in the Aginsky Datsan, one of the oldest and most beautiful monasteries in the Zabaykalsky Territory. The datsan itself was closed, its buildings torn down and its valuables – art and ritual objects – ended up in museums in Moscow, St. Petersburg and Ulan-Ude, the capital of the Republic of Buryatia. 5. Siberia’s biggest Buddhist monastery and learning center is the Ivolginsky Datsan near Ulan-Ude in Buryatia. Its construction began soon after World War II during the reign of Stalin when the authorities offered a small land plot near the village of Verkhnyaya Ivolga and a prosperous Buryat family gave their own house to serve as a temple. Nowadays this is the most revered monument of architecture and culture in Buryatia consisting of 10 temples, a university building, a museum, a guesthouse, an open-air cage with roe bucks and a greenhouse with a Bodhi tree, which is sacred for Buddhists. 6. The Ivolginsky Datsan holds one of the most important holy relics not only of Siberia, but of all of Russia: the eternal body of Lama Dashi-Dorzho Itigilov, who was the leader of Siberian Buddhists at the beginning of the 20th century. He died in the lotus position in 1927, but his body is well preserved and remains a subject of medical and biological research for 21st century Russian scientists. Now Itigilov’s body is kept in a special blessed palace on the territory of the Ivolginsky Datsan. 7. If you are going to visit a Buddhist monastery, there are a few rules that you need to keep in mind. You should tour the temple walking clockwise – such a circular path is called “goroo” and symbolizes a rite of purification. On the way you’ll see the “khurde” drums, which contain the texts of prayers. You can make them rotate – this gesture is more or less equivalent to a prayer among Buddhists. You can visit all open temples and non-Buddhists are allowed to attend services. Inside the temple it’s best not to turn one’s back to the statues of Buddha or cross your legs or arms when sitting on the low benches along the walls. Your clothes should be modest – women should avoid mini-skirts and short tops – and you should remove any kind of headgear. You cannot smoke or throw away garbage on the territory of a datsan and in some temples taking photos is forbidden. Pay attention to all posted notices.